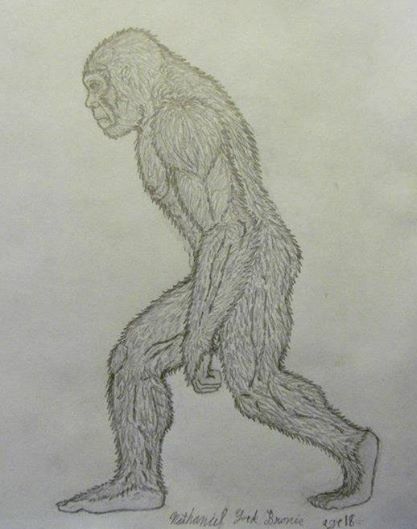 How were you able to determine (from 120 feet away) that what you allegedly saw was a male [sasquatch]? I did not go back with a long tape, I did go back and walk toe to heel and came out at like 115 to 118 steps ( I don't remember what size shoes I had that day ). The 120 feet is my closest estimation. 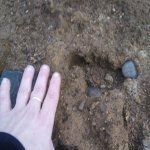 I was able to see that the creature had male equipment ( general shape and bulge was visible at times both in profile and turning ) besides his physical frame. I could not see details ( there was thicker hair around the area ) but I could see some color and texture difference with the lighting I had at the time. I guess I will be frank, there was something there that contrasted with the hair color and pattern that indicated a protrusion of soft tissue that was dark gray/brownish ( not as dark as the hair ). I honestly can't say much more than this as I was more concerned with where it was looking and moving. Great! Thanks. What's strange is that those drawings don't look much like the syskesville monster which looks very human, with short hair, to me. Sure, but add an inch of hair to the middle of the face, and 4 inch hair all over the place on the top and sides, and it would get mighty close. I suspect hair length and color can vary quite a bit with age, region, and even individually- but they would all have hooded noses for instance. Is this the Sykesville Monster piece you're referring to @NathanFooter? Yes, the hair was a little longer on top a fair amount so on the sides and back of the head. Hair also crowded up from under the bottom of the cheekbones toward the nose. I am not a great artist but this is a drawing I did a while back from a profile view. And your drawing is quite good! Them being hunched over when walking doesn't make too much sense to me unless it's a precursor to getting down on all fours. @ NathanFooter, curious that your drawing shows a mid-tarsal break in the left foot. Is that something you observed? About 5 years ago after I was on the Forum for a few months I did some data mining into John Green's database. The nose issue was what I was trying to nail down to see shape was at all gender related. 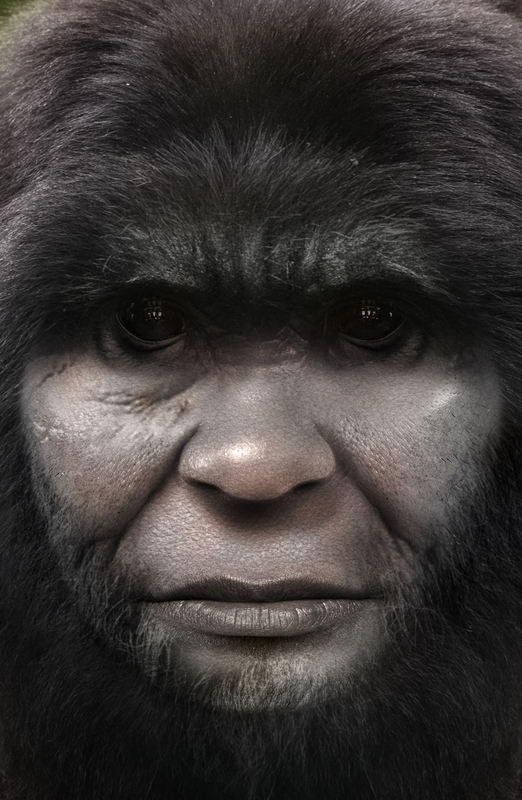 From what was in the database it seemed that the more Human-like noses were males and the more ape like noses were females. It was a generality that didn't really hold true though. Because after collecting the reports together and seeing what looked like nose/gender distinctions I researched where witnesses reported seeing the creatures in groups. Some of the groups has small creatures mixed in t=with the large and medium sized individuals. I cross referenced nose shape with the reported groups and each group did NOT have a mixture of nose shapes. It was either a group reported with Human like noses or a group with ape-like noses. I came away thinking that possible different nose-shaped creatures didn't mix. It is also probably a wrong conclusion as well but that's what came out of the small sampling that was in the database. Well since the John Green database was brought up, here are some numbers. This may be a bit silly but if they had larger nostrils proportionally than we are used to seeing on humans, could the angle of viewing or distance effect that description of hooded or not? Could posture, shoulder position or holding their heads upward may also factor in. Could both descriptions be "right" based on perspective? Good point and in some cases that may have been true. But for an ape-like nose I don't think the face could be positioned in a way that would make it look hooded unless it's at a distance looking almost straight down? Side profiles probably come into play as well. IMHO, looking straight on face to face would have the potential for errors in nose descriptions. That and short visual durations, time of day etc..
Yeah im with you but I’m just of the opinion that these things could look different to each other and even something as extreme as having completely different noses ? Well, if you're looking up at something considerably taller than you it's going to reduce the appearance of a hooded nose and make it look like it's just nostrils. But, that would only apply if you're very close or it's very tall. Though the creature being on a hill or tree located above your position would again heighten that perception. Good observation imho and not silly at all. I like this artist. Haven't seen one yet. 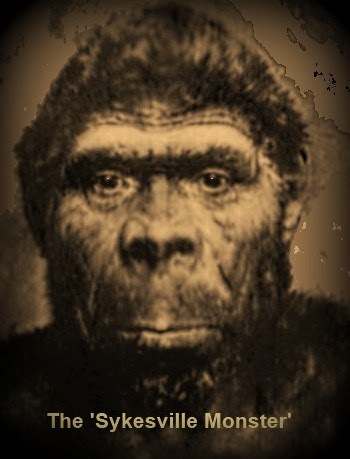 The blobsquatch in my photo looks similar to this dude, as far as I can tell based on facial structure. Very generally speaking.Very, very generally. Maybe you guys can take a look and see if anything looks like what you saw? I have a theory on the walking hunched over. A few years ago I was hiking in Rocky Mountain National Park with my wife and two daughters. I was carrying a full backpack stuffed with water bottles that at the beginning of the hike must have weighed 40-50 pounds. We took a break at a waterfall and when I took off the pack I almost fell on my face. I did not realize how far forward I was leaning to adjust for the pack. I used to run on gravel as a kid barefoot. 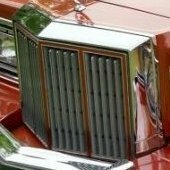 I also built match box car tracks on the county road on my knees for days on end. Scrambling to throw all my cars off the road when a real rig came barreling along. My point being is that your body gets used to being asked to do jncredible things. Calloused pads form and give you protection. I remember reading about a barefoot slave in the 1800's, that he had stepped on a ember by the campfire and didnt know it. He kept smelling something until he realized his own foot was smoldering. Now thats a callous! A hunched yet high stepping gait (not to mention occasional four legged crawling) is also quite expected in a thickly forested environment where one is constantly moving both over and under branches.